An expiry mostly controlled by bears. Further down-side seen ?! It was an expiry almost controlled by bears and was exactly confined between the levels of 4932 and 4826 indicated in yesterday. Though the close was higher at 4867, in the battle between 4900 calls and puts, it was decisively the bears that won the battle in the end. The most crucial support level of 4807 was left untouched yesterday and that points to more weakness setting in, in the short term. The 200 DMA on extrapolation will be at 4700 levels in another two weeks and markets could also remain within 4700 and 4950 levels in the short term. Bears to show their might for expiry also. A close around 4826 ?! Bears have totally dominated this series in the last few sessions. 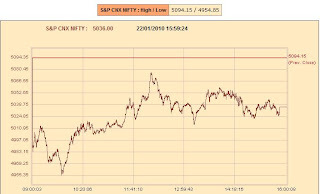 In yesterday’s intraday pattern, there has also been a strong bull trap at 4903 level. It is unlikely that Nifty moves above 4903 levels in today’s trade and even it it breaks that level, the strong ceiling is around 4932. 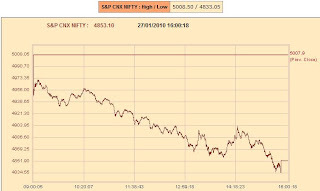 Markets will be controlled by bears towards the end of the day for this expiry and a close of 4826 is expected for the January series. A day completely below the lower band. Bears to take control ?! 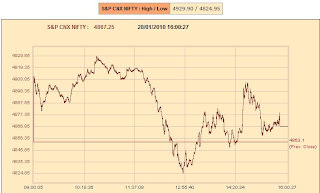 On friday, Nifty was unable to move above the previous close and had stiff resistance at 5036 levels. 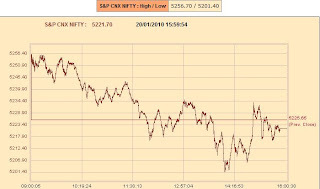 Though the close was above 5000 levels, looking at the pattern the entire day’s trade has been under the lower band. This has imparted bearishness and it looks like bears will take a strong upperhand and can push Nifty to test further lows. A break of 4950 levels will be extremely bearish for the short term. Resting on the lower band and a crucial session to decide the short term trend ?! Nifty tested further lows after breaking the lower band on friday and though it gained from its lows, it is still at a crucial level. 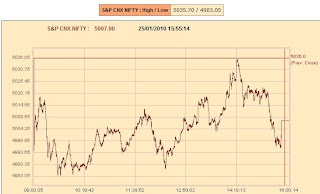 The volumes were heavy and any further break of 4985 levels would bring in more weakness. There has been a strong resistance established at 5077 during intraday on friday. Any move above that level could push Nifty towards 5100. As of now it is a wait and watch situation as market could turn eitherway from here. With a powerful bearish move, increase in volatility seen..What next? Markets were totally under bear grip yesterday and the key support levels have been broken and also the close is well below the 20 DMA with an increase in volume. Indicators are pointing to a short term weakness and markets might close for the day near the lower band at 5018, even if it tests further lows. Back to test the 20 DMA…Getting ready for a bullish move ?! Yesterday was another doji day and markets closed around the support level of 5225. Also the key resistance and support levels of 5256 and 5201, mentioned yesterday were tested and it looks like market is back to test the 20 DMA around 5185 levels. Indications are still pointing to a bullish move anytime and it is unlikely that markets go for a strong correction at this stage. It might remain range bound again between 5160 and 5256 levels before going for the next bullish move. Back to the strong support level. A bounce again from here ?! The consolidation is heightening with volatility shrinking to year lows. 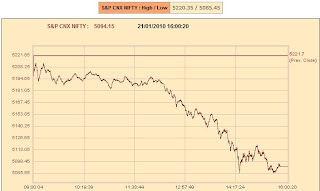 Yesterday markets closed at the crucial support level of 5225. This has been a key level as seen for the past few sessions and the earlier bounce also happened after a retest of this level. The range is becoming narrower between 5225 and 5285. Though the undercurrent is bullish, bulls are unable to push the markets beyond 5285 and it seems like more consolidation is required to do that.